Have you read that piece on THW about Corsi? No? Well, quick. Go do that. Because Fenwick is so close to Corsi that it’s not even funny. How close? Let me show you. The basic difference in the two stats are simple. Corsi tracks all shot attempts. That includes shots on goal, shots that miss the net, and shots that get blocked by skaters. Fenwick, however, does not take blocked shots into account. Only shots on net and those that miss. This way, Fenwick tracks only the shots that can get through and make the goal track the puck. This will be abbreviated as unblocked shots for the sake of convenience. Right about now, you might be asking: “so why is there a completely different stat for pretty much the same thing? ?” Well, intrepid reader, let’s explore that. Fenwick or Corsi? Which is Best? 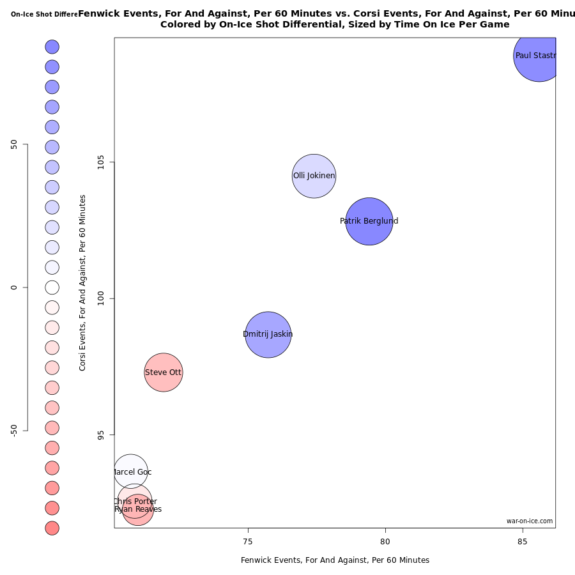 Corsi and Fenwick numbers are often very close to each other. For instance, Drew Doughty currently owns a 56.3% Corsi For while his Fenwick For is 55.9%. The real difference comes in when you focus on the aspect of blocked shots. There are those that believe that a blocked shot is based on luck. When a defenseman blasts a shot through traffic, it might get through, then again it might clip a shin and skitter off into a corner. In Fenwick, that shot attempt is no longer threatening the goalie. In short, Fenwick takes luck out of the equation. Corsi is better for a game by game comparison as the luck aspect isn’t a factor. You need to track more events if you look at a single game. Fenwick, if looked at over the course of a season, focuses more on the possession numbers. Fenwicks keep luck off the table while Corsi is more in depth. However, Corsi can reward players for shooting into the shins of a defender. Are you a better player for failing to get your puck to the net? It really depends on who you ask. Some will swear by Fenwick while others prefer Corsi. The fact is, Corsi is the current leader. The whole idea of advanced stats is to see the game in depth. Taking a part of the stat out of the game takes a little of the depth out of it.